The Aquapac Keymaster is a pocket-sized submersible waterproof case for keeping small but vital essentials protected and on your person. The reason it's called the Keymaster is that it was originally designed for electronic key fobs. 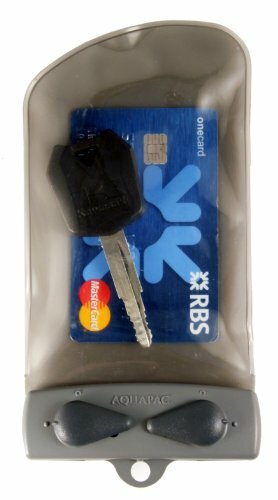 Lots of customers wrote in saying that they had to leave their car key on their wheel when they went paddling or surfing, and couldn't we make something so they could take it with them? So that's what we did! It'll also take care of your credit cards, hotel room key, and a little cash. And if you're one of the increasing number of people suffering from asthma, it just happens to be the right size for most inhalers. The Keymaster is made of a thin but remarkably tough material called TPU and is incredibly light (only 1 ounce / 31 grams including the lanyard). The seams are high-frequency welded to form a super-strong bond. It also protects from dust, dirt and sand. And finally, like most Aquapac cases, it'll float if you drop it in the drink! ABOUT AQUAPAC: - Aquapac has been making waterproof cases since 1983 and has won the Queen's Award for Enterprise 3 times. We're based in London, but our products are to be found on every continent. The vast majority are made in the UK. People are trusting their valuables to our waterproofing, so it's absolutely crucial that our manufacturing is of the very highest quality. 100% waterproof to IPX8 (guaranteed submersible to 5m for 30 mins). Designed for electronic key fobs. Protects other small items too.